Photographic Story. Near my home base of Orlando, the St Johns River connects a puzzle of many large lakes and creeks which created a drinking fountain for the Everglades. The non-profit environmental group, ‘St. Johns Riverkeeper’, commissioned me to create a poster image for their annual Oyster Roast fundraiser, with a theme of “use of the river”. After six weeks of struggling to capture a great image, I had a big stroke of luck with this thunderstorm that broke just at sunset. 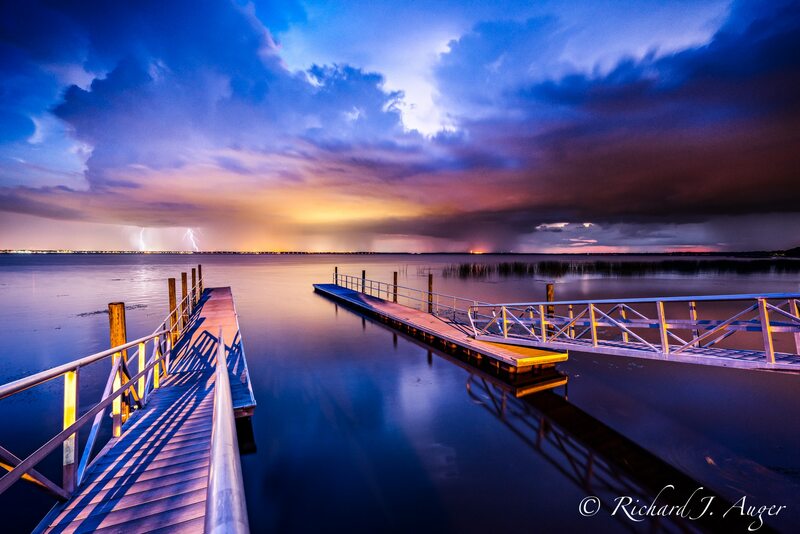 The lightning strikes and colors from the setting sun blend together for a moody scene of purples, oranges, and blues. Standing here at the boat ramp in Deltona, Florida, the city of Sanford can be seen off in the distance.